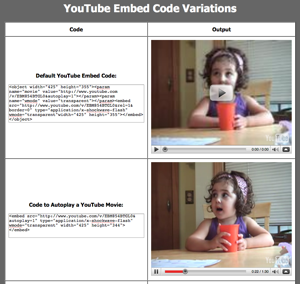 Here are some problems I face when embedding YouTube videos on my website. First, the user has to click on the “play” button for the video to play. People who are new to online video might not even know to how to do that. 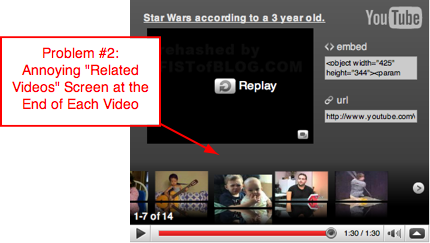 Second, at the end of the video, the “related videos” pop up taking your visitor to other sites. In other words, off your site! 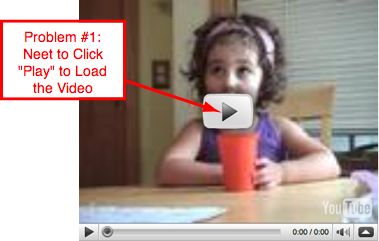 So have you ever wanted your embedded YouTube video to automatically play (autoplay) when your page loads? How about turning off the “related video” feature at the end the video? Want to see what it looks like? Click on the image below to see a live example of the codes in action. Click on this link to get the codes and view the live example. Previous What the @$#@ happen to Godaddy?